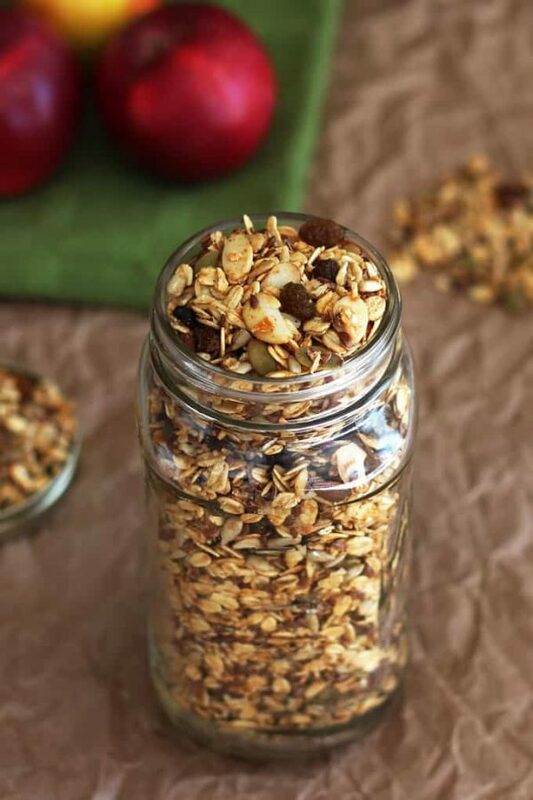 This Apple Granola is made with delicious apple pie spices like cardamom and cinnamon. Enjoy it year-round! I have an undying love for granola!! It’s somewhere right after God, my husband, and my baby. 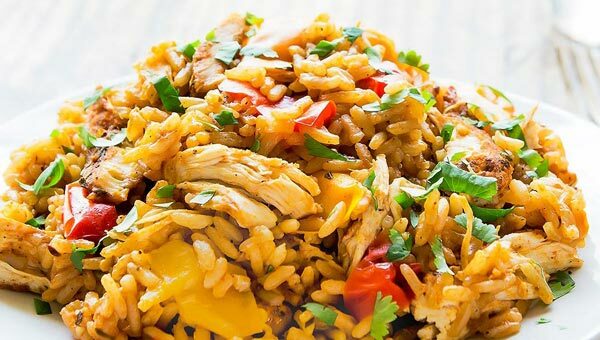 Considering that, I cannot believe I went almost 6 months without posting a new recipe for my favorite breakfast and snack food. But I am here, right now, to remedy that situation. I suppose it is not exactly apple or apple pie season, but aren’t apples available pretty much year-round? 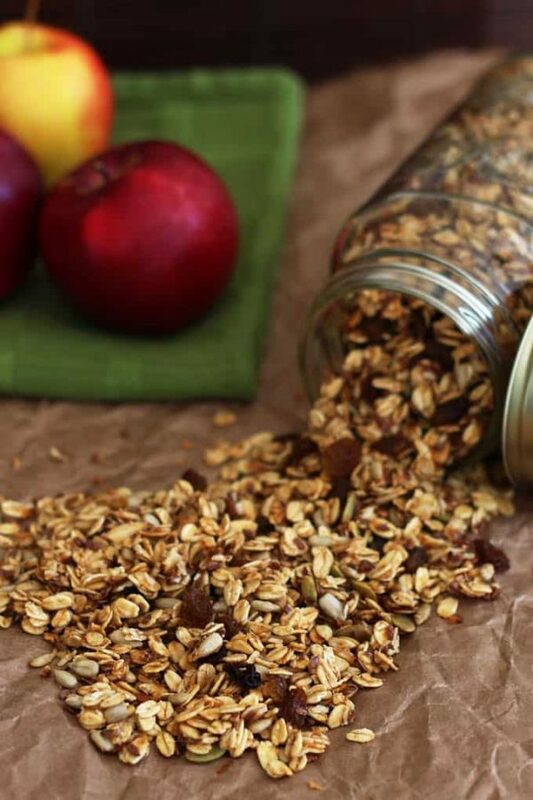 At least apple sauce is and that’s what we need for this apple pie granola. 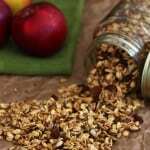 The reason I am calling it apple pie granola are the delicious spices I added into the mix. I don’t know if you buy spice mixes like pumpkin pie or apple pie mix, but I usually just mix my own. Considering, I have pretty much all the spices on hand separately and looking at the cost of a mix, it just makes sense to quickly stir/shake together a few. There is cinnamon, our usual suspect. Seriously, what doesn’t get better with a little cinnamon? And I don’t mean just baked goods. Add a little nutmeg, allspice, and ground ginger plus some heavenly cardamom and your kitchen will almost smell like apple pie already. Similar to my pumpkin granola recipe, this mixture is rather wet before baking. We just need all that apple sauce for the amazing apple pie flavor. For this reason the granola is baked for quite a while on lower temperatures. Just keep checking and stirring it every 10 minutes or so, for about 35-45 minutes until it is nicely golden brown. It might not seem very crunchy yet, but the granola with crisp up as it cools. As usual, I love having this granola for breakfast or to munch as a snack. Sometimes I will have it with just milk, but more often than not, it’s topping a bowl of fruit and yogurt. If you are loving granola as much as me, let me know – what kind of flavor combination would you like to see next? Mix oats, all seeds, nuts and spices in a large bowl. Add melted coconut oil and applesauce and stir to combine. 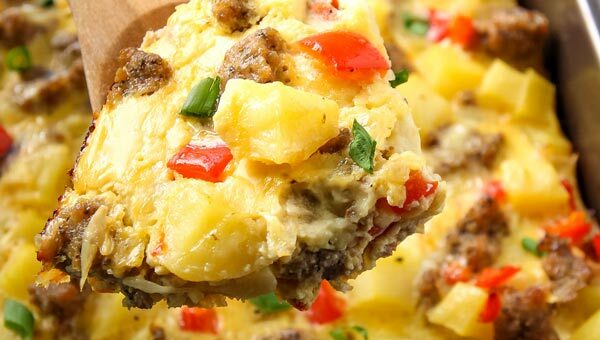 Spread onto a large baking sheet and bake for 15 minutes. Toss and bake another 10 minutes. Repeat tossing every 10 minutes for a total baking time of 35 - 45 minutes until granola turns golden. 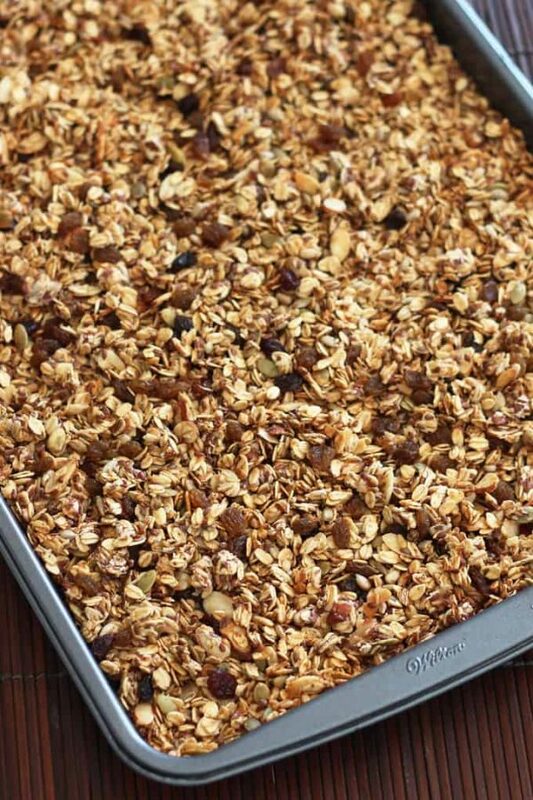 Granola will get crunchy as it cools. 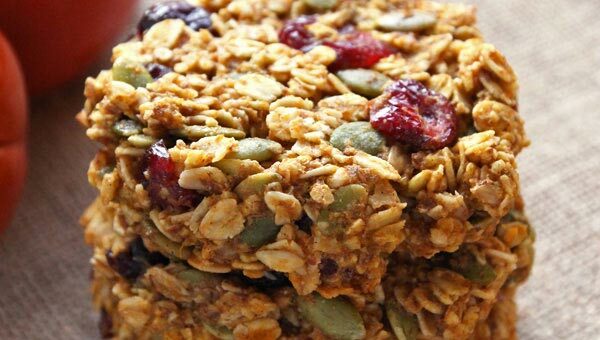 Once removed from the oven sprinkle with raisins and let granola cool at room temperature. 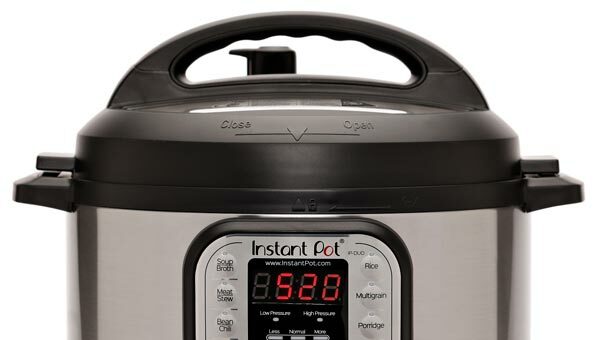 Store in airtight containers at room temperature. 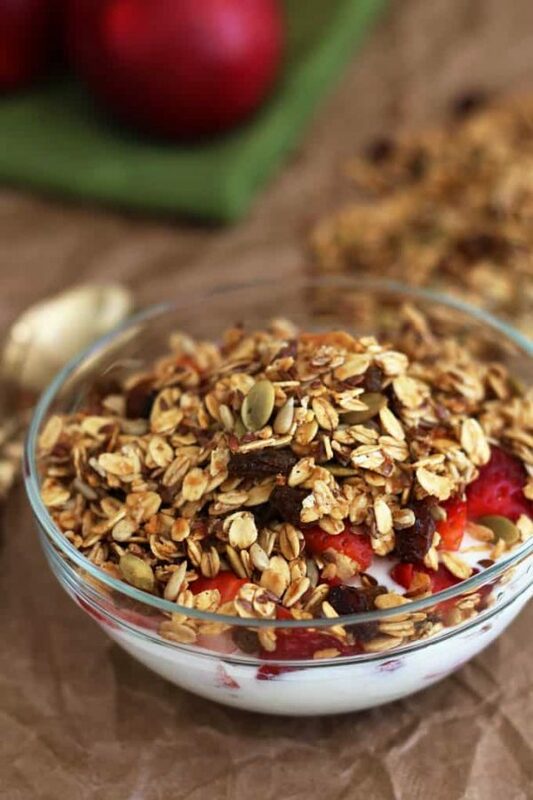 Check out these granola recipes for more granola deliciousness! Homemade granola is my favorite! I could make a meal out of it 🙂 Love this apple pie flavor! It sounds perfect and so delicious!